The 73rd Session of the UN General Assembly opened in New York on the 18th September 2018. ‘UNGA’ means different things to different people. For most, following on their social media feeds, UN week has been marked in recent years by the news bulletin on President Trump’s latest efforts at global diplomacy. For those who live in New York City, UN week is known for the worst traffic jams of the year as world leaders and their motorcades clog up the already busy Manhattan streets. However, for the global development community, UNGA is one of the most important events in the calendar and provides an opportunity for leaders to take stock of the progress the global community has made toward the Sustainable Development Goals – our blueprint for a fairer world by 2030. The message heard in the UN Chamber and echoed through the side meetings this year was loud and clear; we are not going fast enough if we want to achieve these goals. There was therefore significant focus on what steps can be done to accelerate progress and scale up approaches that deliver real and sustainable change. Unsurprisingly, funding and finance forms a key part of these discussions. It is widely recognized that traditional Overseas Development Assistance will not plug the gap in the finances needed to reach the SDGs, an estimated $2.5 trillion annually. New financing models are therefore vital. As World Bank President Jim Yong Kim has said, the world will never reach the SDGs without the private sector and that financial commitments to the goals need to go from ‘billions to trillions’. Many of the world’s leading businesses, who are well represented at UNGA, recognise this instinctively. These companies have committed their own resources to drive social change because they recognise that poverty, inequality and lack of opportunity all impose costs on business in much the same way as they affect societies and governments. Business leaders, such as Royal DSM’s CEO, Feike Sijesma, are using the SDG agenda as a roadmap to unlock this business opportunity. During a session focused on Purpose Led Business, Sijesma reflected on the change in business environment. When asked by journalists 12 years ago when he took the reins of DSM whether his priority was to make money or change the world he said that he planned to do both. DSM stock price suffered as a result of that response but now there is an expectation that the company should strive to do both. This is a direct result of efforts by leaders like Feike who, along with Unilever’s Paul Polman and Mastercard’s Ajay Banga to name a few, have shown when businesses embrace purpose and values, the bottom line can benefit too. Doing well by doing good is not a new concept for business. Market forces have played a crucial role driving many of the changes that have improved the lives of billions and lifted those at the bottom of the pyramid out of poverty. Harnessing this power in a coordinated and sustained way has become the key challenge discussed at many private sector-led UN week side meetings. Strategies to leverage corporate assets to affect change, ranging from corporate philanthropic giving to Shared Value initiatives were shared as examples, but the recurrent theme during UNGA was how to take this to scale. 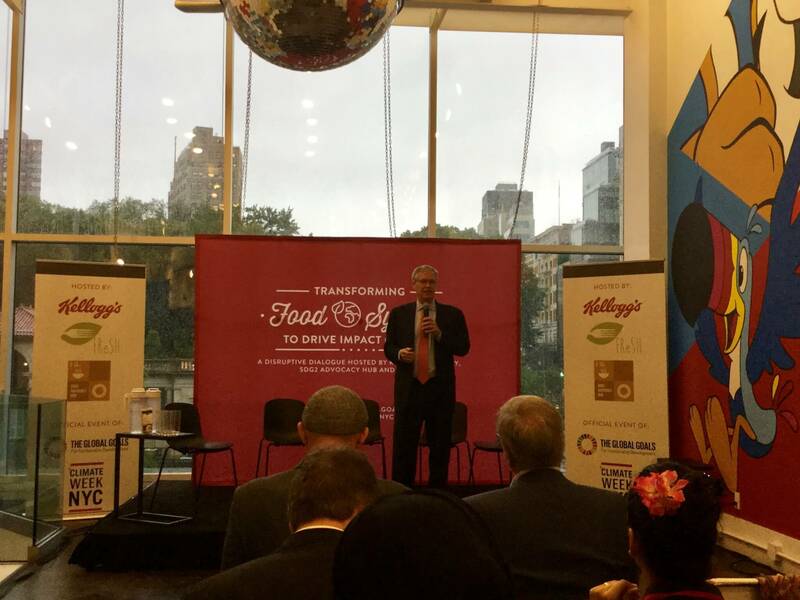 Kellogg Company CEO Steven A. Cahillane at an SGD2 Hub event hosted at the Kellogg Cafe to help build support for efforts to transform food systems and eradicate hunger. The benefit of business scaling social impact is not just about impact figures or SDG targets. The rewards for companies that have an imbedded sense of social purpose are tangible as Rebecca Henderson from Harvard Business School outlined during her lecture on purpose driven business. Successful leaders are implementing new approaches that allows everyone in their company to play a part in delivering social change. They understand that delivering social returns at scale is a huge motivator for employees, consumers and markets. Tackling hunger and undernutrition formed a key part of the discussions at UNGA this year, with SDG2 – eliminating extreme hunger by 2030 – recognized as being a keystone across the whole SDG agenda. The current picture is far from positive. After a sustained period of decline world hunger appears to be increasing again with an estimated 815 million or 10.7% of the world’s population suffering from chronic undernourishment. This reality is especially devastating for the 151 million children suffering from stunting. This is an issue that is intrinsically linked to the environment and climate change – as the sustainability of traditional food sources and stocks are threatened whilst, simultaneously, a third of all food produced goes to waste, and pressures on global food production lead to increase in CO2 emissions. A more positive outlook on this challenge, however, came from Bill Gates at the annual Goalkeepers event, who highlighted the incredible progress made to reduce undernutrition in China since 1990 – and the transformation impact this investment in human capital has had on all aspects of the country’s development. It is also heartening that global businesses recognise the urgency of the situation and are eager to help scale up interventions that can turn back this tide. Businesses increasingly recognise that this isn’t simply a question of philanthropy – investing in nutrition is a means of investing in the next generation of human capital – strengthening the work forces, markets and supply chains of the future. The Power of Nutrition exists to help businesses to drive efforts to deliver improvements to nutrition at speed and scale. At the centre of everything we do is recognition that there must be strong partnerships with diverse organisations that can each bring different skills, resources and experience to the fight against undernutrition. The most exciting aspect of events such as UNGA is therefore meeting like-minded people and organisations who share our values and our sense of optimism that despite the scale of the challenges, goals such as eradicating hunger are within our grasp if we work together and pool our collective strengths, knowledge and resources to deliver sustainable change at scale. To channel Graca Machel’s comments at the Goalkeeper’s event – if we pick a mission, are principled, disciplined and ready to work with others then the SDGs are within our grasp.